If there’s anything truly positive that can be said about 47 Ronin, it’s that this is not your typical studio blockbuster. It’s a fictional take on real events most Western viewers aren’t familiar with. The cast is made up almost entirely of Japanese actors. It’s set in a fantastical version of Japan, filled with creatures more appropriate for a fantasy epic than a historical drama. And it deals with themes of honor and death in a way that doesn’t appeal to our Western sensibilities (including ritual suicide). For Hollywood to spend over $170 million on a film that will likely appeal more to foreign viewers than an American audience is a bold move that indicates the continued globalization of film production could lead to more exciting variety in the types of movies that get made. Unfortunately, variety hasn’t translated into substance. The film opens with a voiceover informing viewers that Kai (Keanu Reeves), a man of half-Japanese and half-British descent, was found close to death in the wilderness as a young boy. Adopted by Lord Asano (Min Tanaka), ruler of the region of Ako, Kai grows close to the ruler’s daughter Mika (Ko Shibasaki), though everyone else treats him as like an outcast—as a “half-breed,” he can never be an official samurai. When foul play by rival clan leader Lord Kira (Tadanobu Asano) forces Asano to kill himself in order to retain his family honor, Asano’s loyal samurai servants are stripped of their rank and banished from the land as ronin, disgraced warriors forbidden by shogunate decree to seek vengeance. A year later, Asano’s most trusted samurai Oishi (Hiroyuki Sanada) finds Kai and convinces him to save Mira by working with a few dozen other ronin to break the law and assassinate Kira. First-time feature director Carl Erik Rinsch and writers Chris Morgan and Hossein Amini present these events not as a straightforward period piece but as a work of Chushingura, a fictionalized account of the popular story complete with witches, mythical beasts and magical monks. It’s a genre mish-mash that feels fresh, combining the fantasy quest elements of The Lord of the Rings with a generous helping of traditional Japanese culture and customs. While things occasionally get a bit too weird just for the sake of being weird – a monk looks like a deformed bird-creature instead of a human being, for example – it’s refreshing to see a big-budget movie tackle a world that’s both familiar and fantastical. Rinsch seems to relish the universe he’s playing in, allowing the first act to unfold slowly but steadily so that by the time the plot really kicks in viewers are used to the film’s blend of adventure. Unfortunately, while broadening the target demographic has led to the embracing of some cool ideas, 47 Ronin presents them in a way that seems designed to offend as few people as possible. As seems to now be common practice in a big-budget tentpole films, it is a movie populated with plot devices instead of characters. The titular ronin are mostly indistinguishable, and even the main characters are painted in broad strokes, seemingly incapable of conflicting emotions. Kai wants to save the woman he loves. Oishi seeks revenge. Lord Kira is evil. This isn’t unforgivable – after all, to a certain extent these characters are meant to function as archetypes – but it’s flat and bland. Though they live in a world filled with pirate slave masters, shape-shifters and black magic, every character in 47 Ronin acts as though these are routine occurrences. Everything is presented with a straight face, as if to communicate that this is a Serious Story of Serious Importance. There’s one small side character who briefly functions as comic relief, the only one who even come close to having an actual personality, and even he has only that one note to play. Reeves is used to playing the strong, silent type, and he does it well, but tonally the film feels more like a somber funeral procession than a fun adventure. Rinko Kikuchi is the only person who seems to be having a good time, chewing the scenery as a gleefully manipulative witch who’s both murderous and seductive in equal measure. The 3D adds nothing, but visually Rinsch demonstrates clear talent, capturing the group’s supernatural encounters with flair while also retaining a clear sense of geography. (The only exception is a scene two-thirds of the way through that smacks of studio interference, in which it’s impossible to tell who is where and what is happening.) The costumes and architecture are all impressive, and the film works well when it’s presenting fantastical events through the lens of real samurai values and concerns. Even the visual effects, which border on the cartoonish, add a certain layer of B-movie charm. 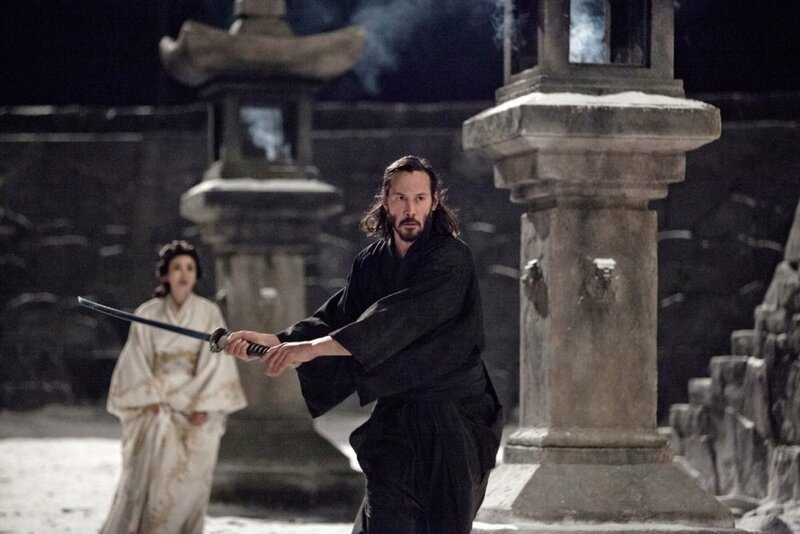 The real tragedy of 47 Ronin isn’t its conclusion – it’s a safe bet not everyone is going to make it out alive – but that such a conceptually rich film could ultimately feel like more of the same. Rinsch’s vision of Japan is brimming with imagination, and I found myself wishing I could spend more time there. I just don’t want any of these people with me.